The Mumias Sugar Company, our host for the first three weeks of this program, is located in Mumias town in Western Kenya. The town is the seat of the Luhya kingdom, Wanga, whose last sovereign king, Mumia, is the town’s namesake. On Sunday we first stopped at the Nabongo Cultural Centre, which was funded by the sugar company and opened in 2008. The culture center included a library, a museum, a traditional structure, and several graves. From what I could understand, Wanga kings were buried where they died and this site was the original grave of the first king, Nabongo. In addition, it appears that Wanga kings’ remains are exhumed and brought to a mausoleum on this site after all their living brothers and cousins have died. This only applies to kings that die natural deaths. Murders, drownings, and other unnatural deaths are considered bad omens. In the museum, there were photographs of the current and previous kings. In these official coronation pictures the text “Wearing bracelets…” followed by the name of the king was written across the top. Interestingly, we learned that the symbol of a Wanga kings’ power is a bracelet crafted from an object from the kingdom’s origin myth. 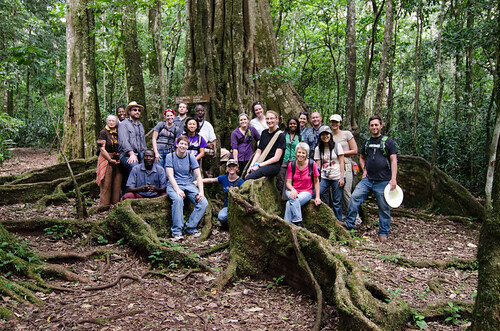 After the culture center, we headed to the Kakamega Forest, just more than an hour away. We arrived just in time to eat the pack lunch from the Mumias Guesthouse, which included chicken, egg, and veg sandwiches, as well as bananas and sodas. There were several sodas I was unfamiliar with, including Stoney and Krest. We also spent a little bit of time sorting out our park admission fees. 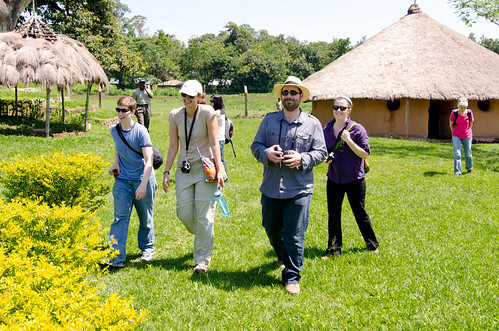 Non-residents are charged $20 USD admission (1600 Ksh), while residents pay only 200 Ksh. Luckily, we were able to negotiate a student rate for the interns. 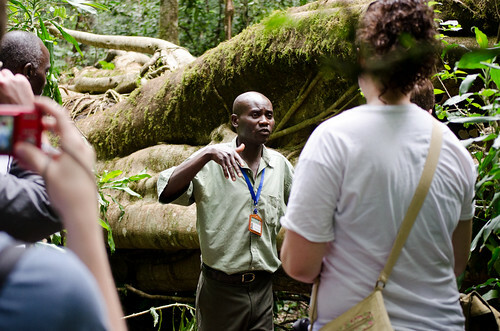 Once in the park, we hired a tour guide who took us on more than four-hour, 15-km hike through the dense forest up the hillside and back down the rugged, rocky face. We also trekked out to a small waterfall and made our way back to the road through the backyards of families that live in the forest. In addition to marveling at spectacular views, we learned a great deal about the medicinal and functional value of several of the indigenous tree species, including on that is a potent treatment for prostate cancer. Exhausted, on our way home we made one final stop at the Nakumatt, the local equivalent of Walmart, before we collapsed into bed, dead to the world. Check the pictures on the Flickr here and here.